A child you care about is grieving the loss of someone loved. You too loved the person who passed away. Now you are faced with the difficult task of helping yourself and the child heal. Throughout the coming months you will be both a role model and care giver. Attending the funeral will help you and your child grieve properly. A funeral can be confusing and scary to children; they should be gently guided through this experience. You and your family have chosen cremation for your loved one. You should explain what cremation is. Explain the funeral and cremation carefully at this unique child’s developmentally-appropriate level. This article was created to help you be compassionate and direct as you talk about cremation. Children are naturally curious about everything, including death. To many families death is a taboo subject. A parent or family member who would gladly help a child with his science homework may be uncomfortable answering the same child’s questions about death, cremation and funerals. You can be the person the child can turn to with questions comfortably. Encourage the child to ask anything about death, cremation and funerals. Always give honest answers in words that will be understood. Keep in mind to follow the child’s lead. If you listen and pay attention to certain behaviors, the child will teach you what he / she is curious about, what isn’t interesting and what might be scary. Give the child only as much information as he / she wants to know about cremation and funerals. If you are honest and open, the child will openly ask any questions that trigger their curiosity. Most adults do not understand what happens during the cremation process. Cremation takes place at a crematory or crematorium. Sometimes crematories are adjacent to funeral homes, but often they are facilities not associated with a specific funeral home. Today there are more than 1,000 crematories in the United States and Canada. A crematory is a stainless steel chamber / retort. Prior to cremation, the decedent is placed in a sturdy corrugated container or cremation casket and then placed inside the cremation chamber. After the container or casket is placed in the cremation chamber, the door is tightly sealed and the operator turns on the heat (approximately 1400-1600 degrees Fahrenheit). A gas jet creates the heat within the cremation chamber. Due to the intensity of heat, the human remains ignite and burn until only bone fragments remain. This process takes approximately 2-3 hours. Once the act of cremation is complete, the remains are collected and placed in a metal tray. At this point the remains are small pieces of bone. To further reduce them, they are placed in a processor and refined down to the consistency of coarse sand. The white or grayish remains, often called cremains or cremated remains at this stage, are then sealed in a transparent plastic bag along with an identification tag. The bag weighs approximately 5-8 lbs. Often the family requests that the cremated remains be placed in a decorative urn, which can then be buried, placed in a cemetery, taken home or transported for scattering. Now you can decide how to answer your child’s questions because you have a better understanding regarding cremation. Whatever information you decide to share, take caution and use words that will be understood. This depends not only on the child’s age, but also the child’s developmental level, personality and vocabulary. If your words and your tone convey you are comfortable with the process of cremation, your child will likely feel the same way. Try not to withhold much information about cremation. Some say cremation is too harsh to explain to children, yet children can cope with what they know. They cannot cope with what they don’t know or have never been told. Often their imaginations can conjure up explanations much scarier than reality. Be careful about using euphemisms or even fibbing to children in an attempt to protect them from the truth. Cremated remains look like white beach sand. When someone is buried all that will remain after time is the skeletal system and cremation provides the same outcome, just within a shorter amount of time. Cremation has been around for thousands of years. The ancient Greeks and Romans built funeral pyres (rhymes with hires), which were stacks of wood the decedent was put on. The wood was set afire and the decedent was burned, too. Funeral pyres are still used in India today. Cremation doesn’t hurt. The person is no longer alive. The decedent will not feel cremation taking place. Your body is just a cavity and the soul has moved on. The crematory operators take their job very seriously and will handle the decedent with the utmost dignity and respect. Children who are included in funeral planning, are encouraged to view the decedent (if culturally appropriate) attend the funeral, and compassionately guided through all these steps are best prepared to begin their journeys toward healing. Remember, any child old enough to love is old enough to mourn. Children who mourn need honesty, love and acceptance of their many thoughts, feeling, questions and concerns-to enable them to heal. Death may be the most difficult thing in life to understand, even for adults. The child in your care may have lingering questions for months, even years, after the event of the demise itself. Be available to the child as time passes. Support his / her unique grief journey. The child who was not curious about cremation at the time of the funeral may have questions later. Passed Away or Dead: The person no longer sees, hears, feels, eats, or breathes etc. The person is not alive. Funeral Home: A place where the decedent is cared for and prepared for final services. It is also a facility that visitations and funerals are held. 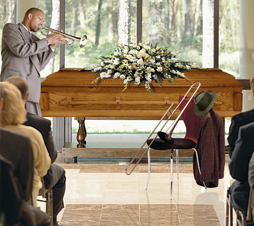 Funeral: A time for family and friends to reminisce and honor the loved one that has passed away. Viewing / Visitation: A final viewing for the decedent for family and friends to say goodbye. Cremation: The incineration of human remains after death has occurred. Cremated Remains: Bone fragments that remain after cremation takes place. Burial: Placing the decedent into the earth / ground. Casket: The final resting container for a loved one. Cemetery: A place where the decedent is interred for family and friends to visit. Grave: The site where the decedent is laid to rest for eternity. Hearse: The vehicle that transports the decedent. Obituary: A short article in the newspaper to notify the public of the death. Pallbearer: Loved ones who help carry the casket at the funeral.